This was a fun theme because there was so much opportunity. 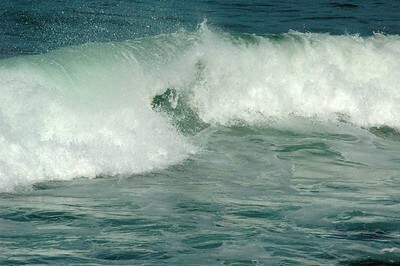 There is something very relaxing about the motion of waves as they roll in and break along the shore. I didn't have my tripod with me for this shot so I was lucky it turned out. I wanted a long exposure so the motion of the crashing wave would explode off the rocks. This was 1/13 of a second hand held. It worked. 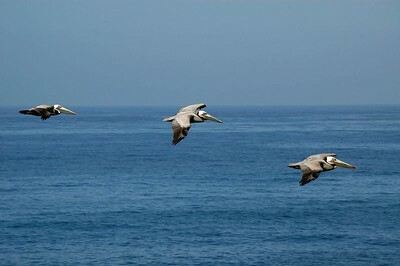 The pelicans would fly around at low tide looking for fish in the shallows. Once a meal was spotted they would dive from 40 or 50 feet hitting the water hard. 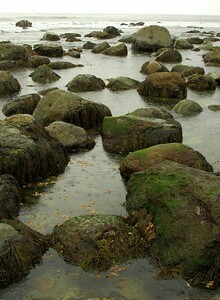 They would come back up to the surface after a second or two, and if successful, fly to the rocks to enjoy their catch. At first glance there doesn't seem to be any motion or action in this image. 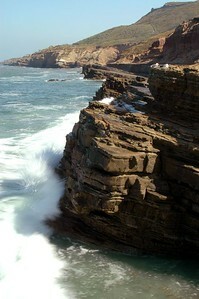 These are the tide pools at low tide on the west side of Point Loma in San Diego. Look closely and you will see the individual rain drops hitting the water, creating a ripple effect. 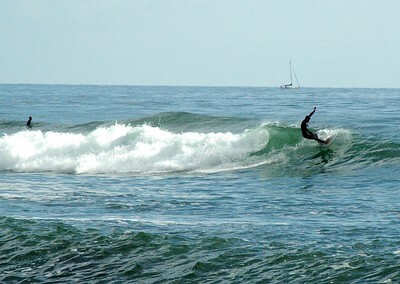 I wanted pictures of Surfers for this theme and there were plenty in the cold waters along the southern coast of California. But they were so far out. 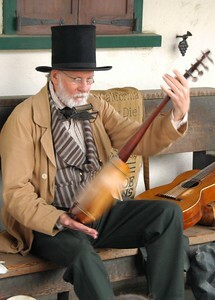 This was shot with a 200mm lens and then cropped to focus on the action. I had already shot a surfer for this theme, but the late afternoon sun back lit the breaking waves producing an emerald green that begged to be shot. The surfer just added to the action. 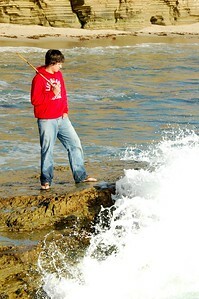 I sent my youngest, Sean, out on this rock just to get this shot. His mother was not happy with either of us. We took about 20 shots to get a good one. 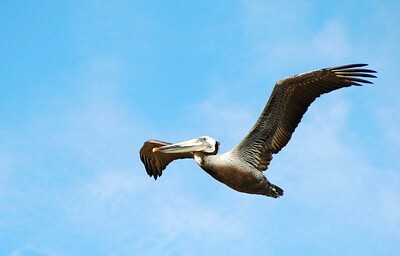 Even though pelicans are big birds they are very graceful in the air. I was fortunate to get this close up showing the detail of his feathers. 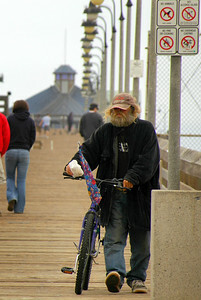 I included this image of a homeless man along Imperial Beach because he was always in motion, collecting food or other items he might want from public garbage cans. This might be my favorite image. 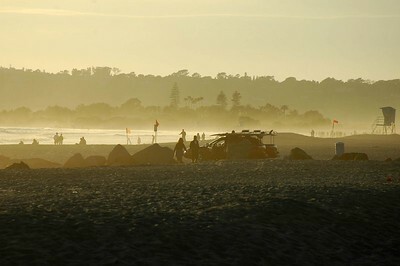 It was just before sunset on Coronado and the sea breeze picked up and was blowing inland. My telephoto lens compressed the distance making the blowing sand and dust in the air look much worse than it really was.